Heading to Vizag and got some days on your hand? We recommend exploring the city at a leisure pace (although the city is small) because that is the best way to explore it. And now that Ola and Uber have forayed into Vizag, traveling from one place to another has gotten easier too. 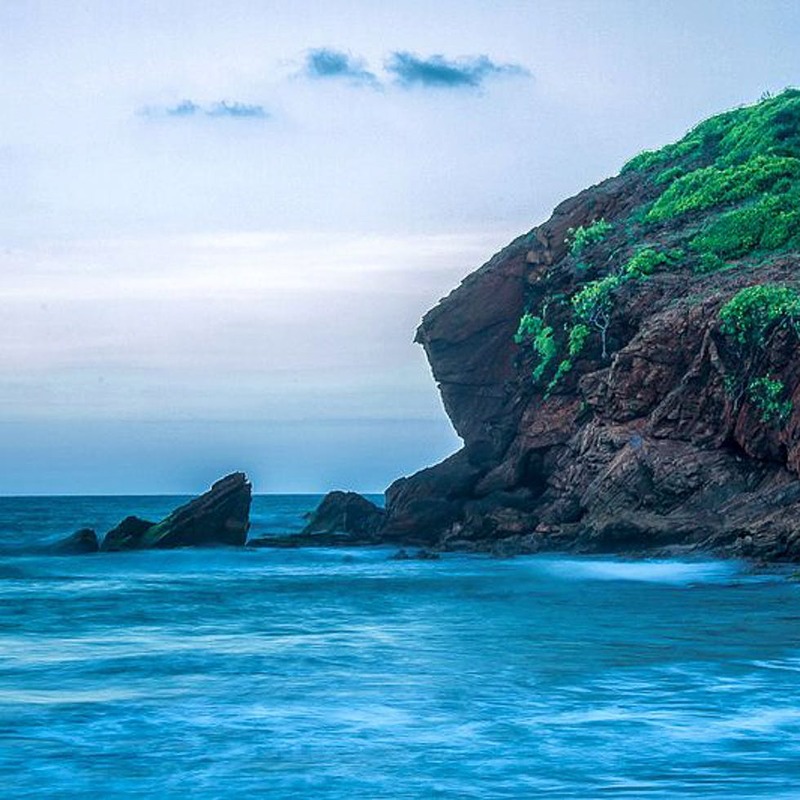 So, here's a list of things you cannot miss when you're in Vizag! Defined by beautiful rock formations and waves that get wilder by the night, Ramakrishna Beach is one of the most popular beaches in Vizag. Come evening, it gets crowded with fitness enthusiasts, foodies gorging on bhutta, mirchi bajji, bandi noodles. Plus, people usually come here after work or college for a few hours of solitude. While you're here, check out a few cafes and stores near the beach. A little touristy but a must-do for a view from the top, Kailasagiri is a hilltop park that offers a panoramic view of Vizag. Get here after the sunset to watch and make sure to get on the cable car that takes you from the top of the hill. There is a Shiva temple that you can check out at this plastic-free hill. You can never go wrong with pani puri and chaat at a tiny kiosk that located right at Bell Park, a multi-store that sells stationery, grocery. Now, these dishes in Vizag are made a little differently from what we find in Hyderabad. The chaat is usually juicier and spicier, and the locals can never get enough of them near this kiosk in Bell Park. Rushikonda has one of the most pleasant and less crowded beaches in the city, and you can score amazing views of the mountains on one side and the unending Bay of Bengal on the other. If you're planning a stay, we recommend the Haritha Resorts, that are perched on the hill. You can also kayak here! A little far from the city, Yarada Beach is located near Gangavaram Beach and Dolphin's Nose (a hill that resembles the nose of a dolphin). Full of rocky cliffs and greens, this beach instantly transports you to an exotic beach. If you have very little time on hand, we recommend skipping other beaches and checking this one out. Located just a few kilometres away from Vizag, Bojjannakonda is a Buddhist rock-cut cave on a hilltop. This is adjacent to Lingalakonda, which is a similar Buddhist heritage site, and both of these are said to date back to 4th and 9th century A.D. You get to trek a bit to reach the top, but the view from up is pretty stunning as you get to see the stupa, paddy fields and coconut trees that cover the village. Constructed during the British era, Mudasarlova is basically a reservoir that also moonlights as a water park. The park is quite spectacular with peacocks, fountains, water tanks, and has a golf course too. If you are planning to check it out, we recommend chilling by the water body and take awesome pictures. INR Kursura was a diesel-electric submarine of the Indian Navy and it has been restored just the way it is for a submarine museum on RK beach. You really cannot miss out on checking this as it gives you a glimpse into a life lived under water. Regarded as the Kashmir of the South, Lambasingi is a sleepy hamlet near Vizag that is eerily beautiful. You can picture Dickens writing fine prose on this place, which is full of towering trees, grasslands, and helpful villagers. If you're up for some snow, Winters are the best time to visit. Also because clouds immerse the green hills, and what a sight it is! Named after a local hillock Kambalakonda, this wildlife sanctuary is for nature lovers and photographers, who can go bonkers. It's located quite close to the zoo and has plenty of animal and bird life along with rare species of butterflies. To explore the sanctuary, it's best to do a trek (which isn't that difficult), and the sanctuary is home to adventure activities that you can indulge in. Craving a bit of home and maybe some biryani? Alpha Hotel in Jagadamba is known for its dum biryani, which legit reminds you of our Hyderabadi biryani. So, get here for lunch, and walk straight into a food coma. Often regarded as 'Ooty of Andhra Pradesh', Araku Valley is a hill station and home to indigenous tribes on the Eastern Ghats. Abundant with forests and coffee plantations, it is known for its rich bio-diversity. When you're here, be sure to check out Borra Caves, Ananthagiri Hills, Coffee Museum. It's going to take two proper days to explore the valley at its fullest. Yet another less crowded beach, Bheemili largely signifies the British and Dutch settlements. It's surrounded by gigantic coconut trees. In fact, you don't really notice the beach until you cross the trees. There is also a Dutch cemetery near the beach that you might want to check out.